The current investing environment will significantly challenge traditional investment models. For decades, portfolios that were comprised of stocks, bonds and cash have performed, as investors have become accustomed to 9-10% returns from bonds(1) and 10-11% returns from stocks(2). Each of those asset classes face strong headwinds moving forward. At Lanier, we strongly believe that constructing portfolios that will stand the test of time must be based on projected returns rather than historic returns. Since the early 1980’s, investors have enjoyed strong returns from bonds as interest rates have consistently dropped. 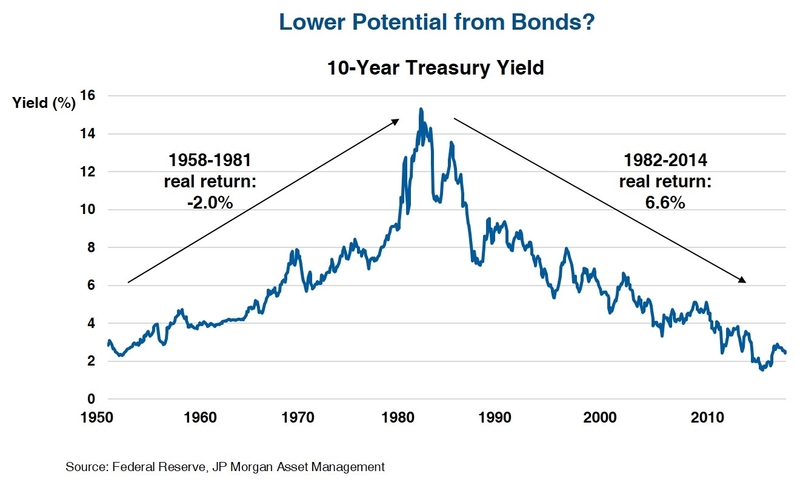 Combining the effects of higher interest rates and the price appreciation of the bonds themselves, the last 30 years have allowed investors to enjoy a 9-10% return (6.6% real return after inflation) on corporate bonds(1). Moving forward, that return model will be significantly challenged. Can interest rates continue to fall from today’s levels? In the last prolonged period of increasing interest rates (1958-1981), investors achieved only a 3% return from corporate bonds (-2% real return after inflation)(1). When rates begin to rise, bond values will fall and the “safe haven” investment in fixed income may become far less safe. Over the last 100 years (1915-2015), investors have become accustomed to 10-11% returns from stocks(2), but if we look at the underlying drivers of stock performance, the future of these investments is similarly uncertain. 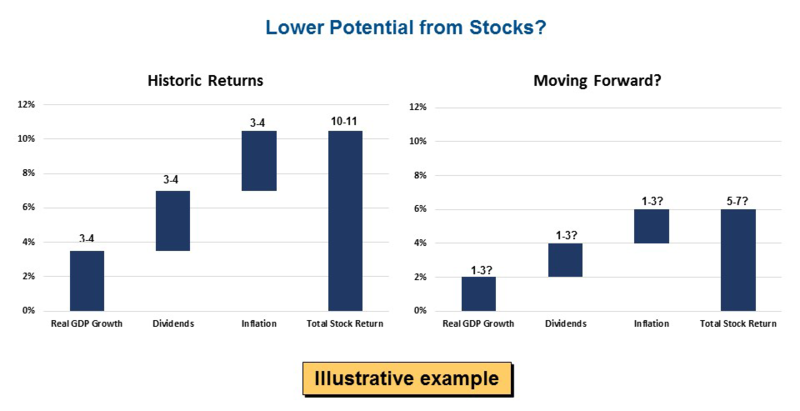 Fundamentally, stock prices are driven by three factors: real GDP growth, dividends and inflation. Historically, each of those factors has delivered on average 3-4% return (3)(4)(5). Moving forward, is it reasonable to assume the same results from those components? If, for example, each of those components delivered 1-3% rather than 3-4%, the result may total 5-7% return – far lower than historic levels. Our philosophy at Lanier is to deliver superior portfolio returns and to decrease the risk in our clients’ portfolios. The solution is to diversify – decrease the reliance on stocks and bonds in favor of real assets and diversifying strategies.